Deletion: A portion of the chromosome is missing or deleted. Known disorders in humans include Wolf-Hirschhorn syndrome, which is caused by partial deletion of the short arm of chromosome 4; and Jacobsen syndrome, also called the terminal 11q deletion disorder. Duplication: A portion of the chromosome is duplicated, resulting in extra genetic material. Known human disorders include Charcot-Marie-Tooth disease which is caused by a duplication of the short arm (p) of chromosome 17. Translocation: A portion of one chromosome is transferred to another chromosome. In "reciprocal translocation," segments have been exchanged between chromosomes. Use the descriptions above to label each of the mutations pictured. 5. 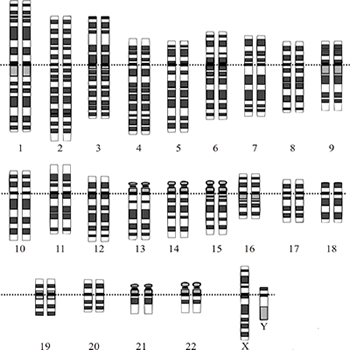 Adjust the karyotypes below to show the karyotype of someone with Wolf-Hirschhorn syndrome and someone with Charcot-Marie-Tooth Disease.